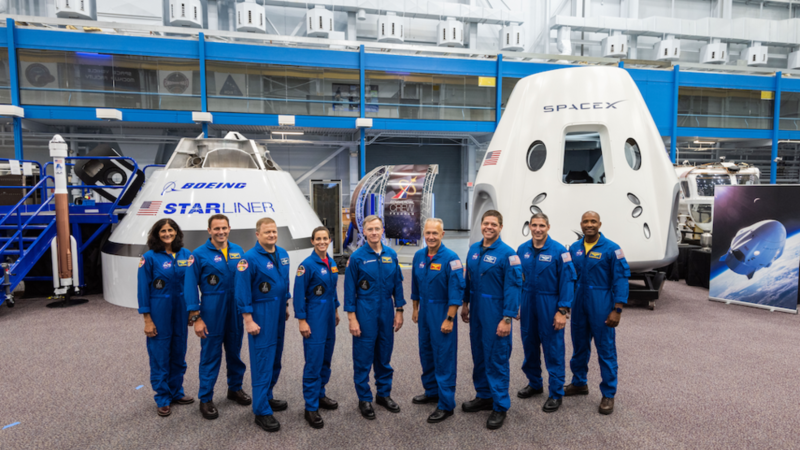 NASA has named nine astronauts to crew the first test flights and missions of Boeing's CST-100 Starliner and SpaceX's Crew Dragon capsule. From left to right: Sunita Williams, Josh Cassada, Eric Boe, Nicole Mann, Christopher Ferguson, Douglas Hurley, Robert Behnken, Michael Hopkins and Victor Glover. In 2019, SpaceX's Crew Dragon capsule and Boeing's CST-100 Starliner are both scheduled to blast off on test flights with NASA astronauts on board. "For the first time since 2011, we are on the brink of launching American astronauts on American rockets from American soil," NASA Administrator Jim Bridenstine said Friday, standing in front of a giant American flag at Johnson Space Center in Houston. NASA astronauts Bob Behnken and Doug Hurley will be the test flight astronauts for SpaceX's Dragon, Bridenstine said. NASA astronauts Eric Boe and Nicole Aunapu Mann are slated for the test flight of Boeing's Starliner, accompanied by former NASA astronaut Chris Ferguson, who now works as a commercial astronaut for Boeing. Ferguson commanded the final mission of the space shuttle program, and Hurley was the pilot on that flight. Now the pair will be among those who usher in a new era for NASA. "The first flight is something you dream about as a test pilot, you know, and you don't think it's ever going to happen to you," Hurley said. "But it looks like it might. Bob and I are extremely excited to kind of put Dragon through its paces in space. " NASA has been collaborating with commercial space companies for years, with the goal of having the private sector take over "routine" trips to the space station and low Earth orbit. That shift came under the Obama administration, which killed President George W. Bush's plan to return to the moon. Lawmakers in Congress, however, insisted that NASA still needed to develop its own rocket and space capsule, called the Space Launch System. And the moon has re-emerged as the pre-eminent space destination under the Trump administration. NASA has spent billions developing the Space Launch System and its first flight, scheduled for 2020, will send an uncrewed capsule around the moon and back. Astronauts aren't expected to go on such a trip until at least a couple years after that. Critics say NASA's rocket is too expensive and won't fly enough to be worth the money. They point to the Falcon Heavy, a brand new, much lower-cost heavy-lift rocket developed by SpaceX, and say that NASA could use commercial options like this one to send up pieces of hardware and assemble them in orbit.